This motorcycle tour is created out of the desire to share the exhilarating experience of motorcycling around the South Indian subcontinent. Discover more about the country, its people, scenic beauty, and culture. What is more is that you get to enjoy the fantastic landscapes and exotic wildlife. Combine them with a strong passion for biking as you ride corners and hairpin roads in the character and longevity of the timeless Enfield Bullet and you have got yourself an experience of a lifetime. After your flight, Kerala Bike Tour will greet you personally upon your arrival in Cochin in the morning and transfer you to the beach hotel. The hotel is nestled among acres of palm trees with uninterrupted views of the Indian Ocean into the sunset. There, you can unwind after the long flight and enjoy some rest and recreation by the pool. Then, you will have an introductory meeting to get to know each other and the bikes. Hopefully, there will be time for a short ride. You will finish off with a welcome dinner and free beers! You will stay at Abad Turtle Beach or similar accommodations. A leisurely breakfast will set the scene for a relaxing day. You can go for an exploratory ride along the coast past mission churches, unspoiled fishing villages, backwaters, lighthouses, and beaches shrouded by endless palm trees. After that, you should be starting to adjust to the pace of life there. You will stay at Abad Turtle Beach or similar accommodations. You are ready for your adventure! You will have an early start on day three for a long day's ride through some truly spectacular scenery. You will traverse the backwaters and rice paddies before starting the ascent through the rubber and tea plantations of the Cardamom Hills and Southern Ghats. You will stop for chai tea and small snacks every hour or so. You will climb on largely empty and well-surfaced roads until you reach the Periyar Wildlife Sanctuary. There, the views become more sensational as the road gets worse! The route is largely untrodden. Whereas tourists usually see the area by taking the boat on Lake Periyar, you will pass through 100 kilometers of the 770-square kilometer sanctuary on your bikes. There is an abundance of wildlife from flora, birds, and insects up to bears, leopards, elephants, and even tigers, although they usually keep themselves well-hidden usually. There is no traffic. The riding will be slow and you will often switch off your engines to freewheel down narrow lanes and take in the full sounds of the forest. There is an easier route available too and if there is any risk of animal attacks, you will use that route. After riding to over 2,000 meters, you will finally meet up with the good road again and rejoin the highway for the final short run into Kumily. The temperature there is much cooler than by the beach and you can reward yourself with a nice hot shower. You will stay at Greenwoods Resort. You will stay in Kumily on day four so you can decide what you want to do. Later, you will stay overnight at Greenwoods Resort. You will drop down to the plains, again, on some very good roads and stop for a traditional Tamil lunch at the foot of the Palani Hills. You will head off in the heat of the day but temperatures will soon drop as you ride up to the hill station of Kodaikanal at 2,000 meters in just 30 miles. You will stay overnight at Villa Retreat Hotel. A mid-morning start will give you time to cruise back down and stop for lunch at a restaurant at the foot of the Palani Hills. You will then ride across the plains for about an hour before climbing again through 17 hairpin bends and the start of the road of never-ending tea plantations. After stopping for tea on the edge of the Tata tea estate, the world's largest with a splendid view over Devikulam Lake, you will carry on to the enchanting hill station of Munnar and your hotel, Fragrant Nature Hotel. You will have a chance to explore the delights of Munnar and the surrounding area. About half of the total world population of about 2,000 animals live in the ranges below the Anamudi Peak which has an altitude of 2,695 meters, the highest in Southern India. Later, you will stay overnight at Fragrant Nature Hotel. Leaving Munnar, you will ride through Eravikulam Park with its abundant monkeys and scattering of elephants, leopards, and tigers. You will then pass through Chinnar Wildlife Sanctuary, stopping for tea in Marayoor, famous for its local sandalwood. Looking out for herds of wild elephants sauntering across the road, you will then descend to the plains of Tamil Nadu and stop for a late lunch at a roadside restaurant near Coimbatore. Then, you will head back up into the Nilgiri Hills, hairpin bends aplenty, to a height of 2,000 meters. You will stay overnight in Ooty, the “Queen of the Hill Station” at Holiday Inn Gem Park. You will see Ooty by motorcycle or on foot. You will ride up to the Doddabetta Peak for fantastic views of the surrounding plains, or Avalanche Peak where there was snow and an avalanche occurred many years ago! You will take your final mountain ride down a steep ghat road with over 40 hairpins to Masinagudi in time for a relaxed lunch. You will stay overnight at Jungle Retreat. An early start will let you go looking for elephants and tigers if you have not spotted any yet. After a fantastic hearty breakfast, you will be back on the motorcycles to traverse the huge Mudumalai Wildlife Sanctuary and into Karnataka State. You will stop for a pleasant lunch in the Bandipur Sanctuary and then head west into Kerala. You will pass through the Muthanga and Wayanad sanctuaries where you can spot the deer, wild boar, and langur monkeys which are common and if you are lucky, you will see elephant herds browsing near the roadside. You will stay overnight in the sensational Vythiri eco-resort in the middle of the forest. Heading west, descending the ghats, and then south, you will avoid the horrendous congestion of Calicut and arrive by mid-morning in Guravayoor, one of the most famous temples and pilgrimage sites in southern India. You will stop at the Sanctuary for Temple Elephants. A handler will show you around and explain the personalities of the elephants. You will have the opportunity to be with the elephants, without any barriers or cages. Then, you will be back on the bikes for a quiet section of the coastal road to the beautiful and undeveloped beach resort. The people there are incredibly friendly and will make great efforts to wave and shout as you pass. They want you to feel most welcome and have not yet become blasé towards strangers. You will stay overnight at Cherai Beach Resort. You will have time for an early dip in the Arabian Sea before you head off for Kodanad. Kodanad is a forest department kraal where orphaned baby elephants are rescued and cared for. Timing is crucial so, you can join in the daily bathing and rubbing down in the river, so no lie-in on day 12! A little known but well-kept road will lead you to the hotel. It is close to paradise and you will spend the evening watching the birds nesting for the night and the villagers playing and working in the lagoon with the croak of bullfrogs to complement conversations. You will stay at Hornbill Camp. As the tour draws to a close, the excitement and variety will not cease as you change the mode of transport on day 13. An early morning plantation walk will be followed by canoeing in the Periyar River with its sand boats. In the afternoon, you will take a short ride into the forest where there will be a boat trip on the lake to go elephant and wildlife spotting. You will stay overnight at Hornbill Camp. The final ride will take you back to Cochin and it will be the last chance to seal those memories. You will say farewell to the bikes. You will bring the tour to a close with a farewell dinner overlooking the harbor. Beer is once more in the house! You will stay overnight at Secret Garden Hotel. The team will take you back to the airport for your morning flight home and you will say your goodbyes. Until next time! As well as the new 500cc Royal Enfield motorcycles, Kerala Bike Tour has some “traditional” 350s, modified to improve their touring ability with higher bars and improved grips for comfort, reinforced rear struts to improve handling, chrome mirrors, crash bars, and short silencers. Daniel Benster was born and brought up in Yorkshire, UK. He’s 48 years old. He first came to India in 1992, when he bought his first bike in Delhi, a 350cc Enfield Bullet. That’s where his love affair with India, the bike (which he still owns), and the experience began. Born out of the desire to share this fantastic experience of motorcycling around the Indian subcontinent, Kerala Bike Tours was founded in 1999. Now 26 years and more than 200,000 kilometers on from the first riding with his beloved bike, and 19 years since running his 1st tour, Mr. Benster wants to share his passion with you. During this tour, all breakfasts, soft drinks, and bottled mineral water will be provided. If you have not quite chilled out enough in Allepey, you can book a massage, go to a yoga or cookery class, or just order a refreshing beer, grab a hammock, and relax! If you would like, there will be an early 06:00 a.m. start to take the Periyar Lake boat trip or you just stroll around the town of Kumily, take in the sights, do some spice shopping, and enjoy the atmosphere. If there is time on day five, you take the bike around the paths of the summit, explore on foot, hire a boat on the lake in town, or just enjoy the local dairy products such as cheese and ice cream, plus mushrooms. On day seven, go in search of the Nilgiri Tahr, a rare mountain goat, in the cool of the morning. Ride the beautiful road down to Marayoor or to the Mattupetty Dam and up to Top Slip. Visit the tea museum and take a jeep tour to the highest tea estates in the world. On day nine, you go on a trip to the botanical gardens, English-style schools and churches, tea gardens, and shops, or just sleep in. Upon arrival in Masinagudi, you spend a pleasant afternoon by the pool or go search for tigers in the forest. On your trip to Cherai Beach, spend the afternoon catching sights of rays in the sea and if you are lucky, dolphins too. Marvel at the sunset and take a dip in the Arabian Sea. On day 13, you have the option of white water rafting. If you do not have books to finish, take a mountain bike ride in the evening. In the afternoon of day 14, there is time for sightseeing and shopping in the old town. The atmosphere there is somehow different and unlike any other Indian city, it is more relaxed and open. There are famous churches, cathedrals, synagogues, and palaces which are all within walking distance. The sights and smells of the famous Chinese fishing nets and the market, with its teas, spices, nuts, fabrics, rosewood, Kathakali masks, and cigars will make it an enjoyable wander. Take an early evening stroll around the fort with the sun setting against the Chinese nets and giant container ships offering defining images of Cochin. Please book your flight to arrive at Cochin International Airport (COK). Transfer from and to the airport is included. Kerala Bike Tours will pick you up from the airport. 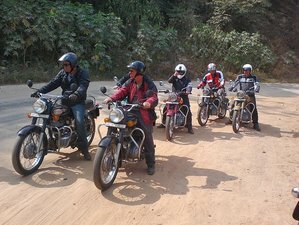 Kerala Bike Tours is a motorbike adventure tour and rental company organizing guided motorcycle holidays and hire in Southern India with Royal Enfields. This tour requires a minimum of four riders.